So you’ve been rocking your dreadlocks for awhile now and itching for some inspiration to take things up a notch, am I right? 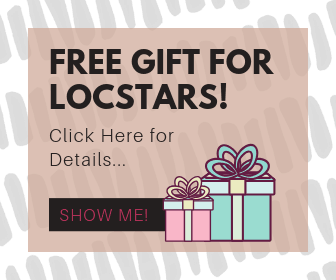 LocStars often get the itch to adorn their locs after the starter phase and begin surveying their local loc salons, summertime cultural festivals and the interwebs for ideas on decorating their dreads. Whether you call them loc beads, dread beads or simply dreadlock accessories, the fact remains, it’s a lot of fun to accessorize your locs with hair jewelry that speaks to your signature style. Dread beads come in a variety of shapes, sizes and styles. From au naturale wood, to hand-crafted polymer clay, to peyote stitches, to pre-cast metal alloy, glass and blinged out crystals. No matter your style you’re sure to find loc beads that will represent you well. The tricky part is finding dread beads that are sure to fit your locs. The first step to a successful shopping trip in search of dread beads and other loc jewelry is knowing the size of your locs. 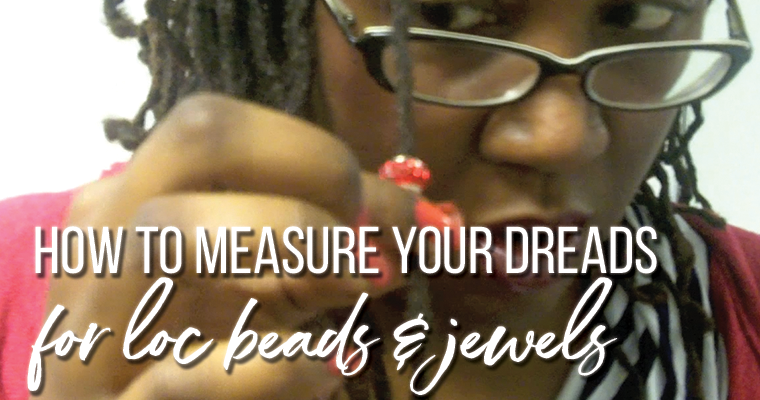 When looking for loc jewelry or dread beads to accessorize your dreadlocks, it’s important to first know the diameter of your locs so that you can find the right sized dread beads. Knowing the thickness of your locs will save you lots of time while shopping and prevent the disappointment of discovering later that the loc bead you spent all day picking out doesn’t fit or won’t stay on. Most beads and assorted crafts are measured in millimeters so grab your handy ruler and measure the thickness of your locs before you pick your adornments. Having this measurement on file (i.e. memorized or jotted on a piece of paper and stashed in your wallet) will save you a lot of time and headache in finding the right beads and accessories. How to put dreadlock beads on: Place the bead at the end (tip) of your dreadlock. Slowly slide the bead up towards the root of the loc until it becomes snug. If that is where you would like it to stay then give it a quick tug to confirm that it won’t easily slide off. If it is somewhat loose or slides too easily, tie it through your dreadlock with a small piece of thread that matches your hair color to secure it in place. 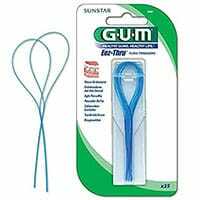 *Quick Tip* Dental flossers are great for threading the bead through the loc, when necessary, to secure the bead. It is a best practice to remove any hair jewelry before washing, swimming or any other activities that would allow the hair to become soaked. This precautionary step allows you to avoid any discoloration that may result from the hair jewelry becoming damp (sometimes colors run and metals oxidize). 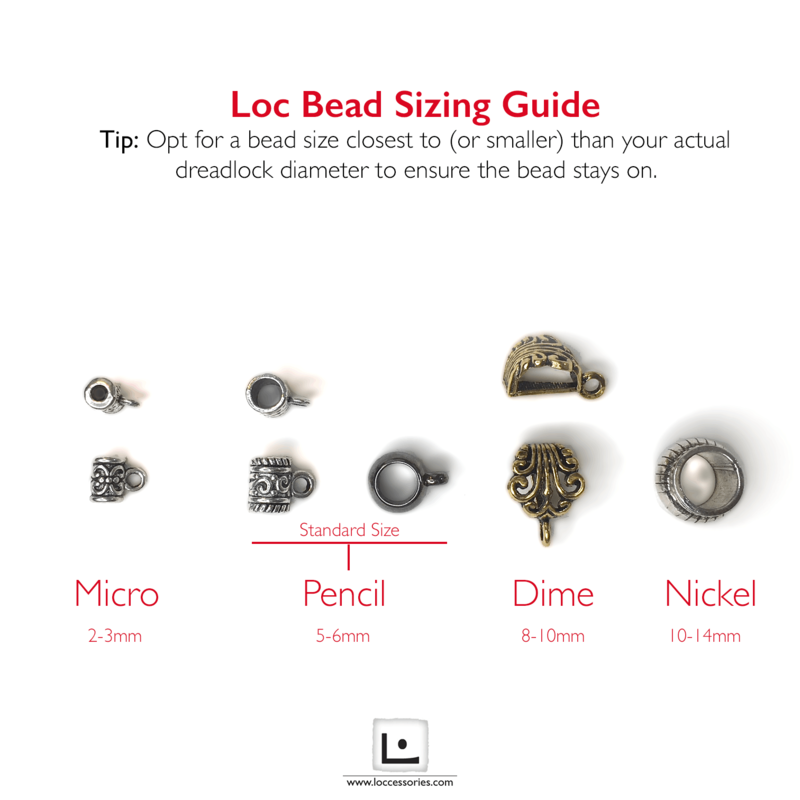 Loccessories has developed a handy dreadlock sizing chart (shown below) to help you figure out the size of your locs. Whether you use it to purchase loc jewelry from us or another store, this should help you make sure that you’re getting the right size that you need. Wondering how to put dread beads on braids? Not surprisingly, it’s the same process as putting beads on dreadlocks. However, because of the silky texture of synthetic hair commonly used for braiding, they may slide off more easily so just be sure to use beads that are closest to the thickness of your braid. A lot of people choose adjustable dread cuffs instead of dreadlock beads for this reason. The styles available as dread cuffs are more limited than actual dread beads and dread cuffs tarnish quickly but the option is definitely there. What about the fellas? Are there dread beads for guys? Dreads beads are a unisex hair accessory and many styles are suitable to both men and women. It is only when you start getting into custom designs that they tend to skew feminine or masculine. But it’s really up to you and your preference. If you like the style, it doesn’t matter if it’s marketing to a specific gender…just wear what you like! Ready to decorate your dreads? 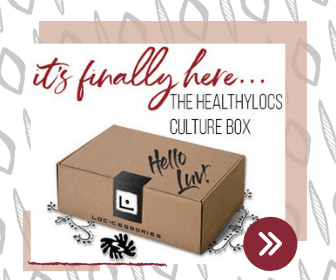 Check out our current collection of loc jewelry here and be sure to join the VIP Hot List as we’re always adding something new!